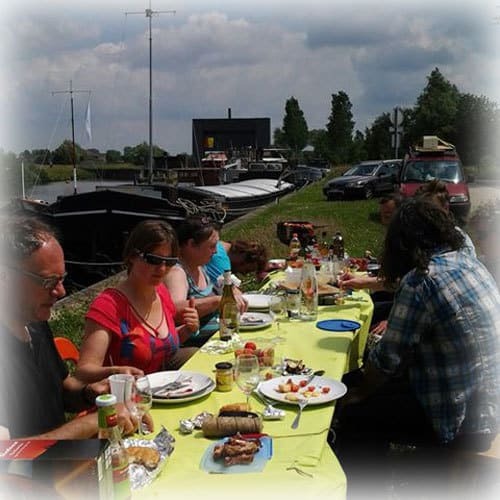 30th June 2013 – You can’t always work, and so a neighbour and me decided to organize a BBQ! It took all day and lasted all day. So did I! 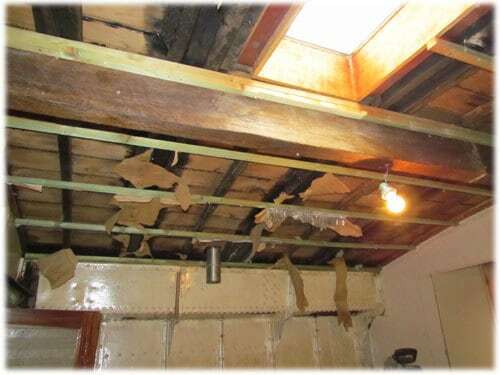 29th June 2013 – While breaking down the second bedroom, I started to smell and feel a lot of moisture. 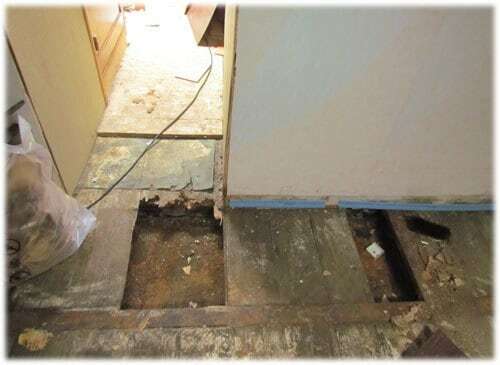 Quickly I discovered the bathroom must have been leaking for years (and still does). 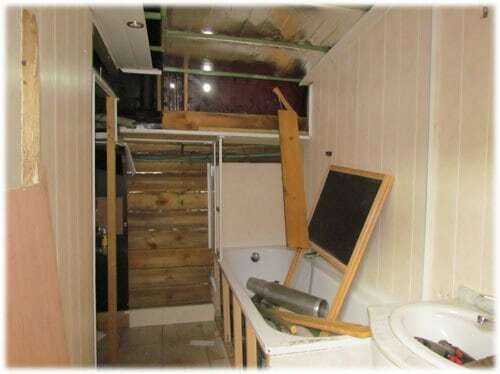 This means, I will remove the bathroom before I continue with the rest of the ship. Since I want no leaking water tank, I’m carefully disconnecting pipe by pipe and wire by wire. 23th June 2013 – It has been raining the whole day. I was expecting it since the forecast was right this time. A perfect moment for an inside job. 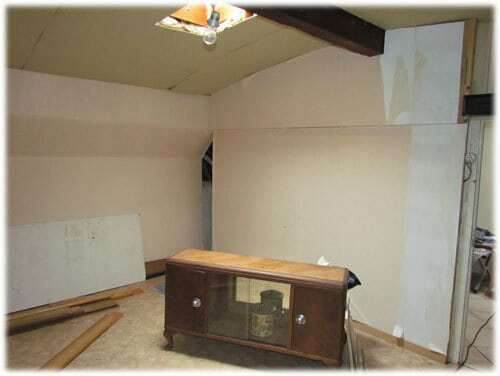 I broke down the second bedroom. 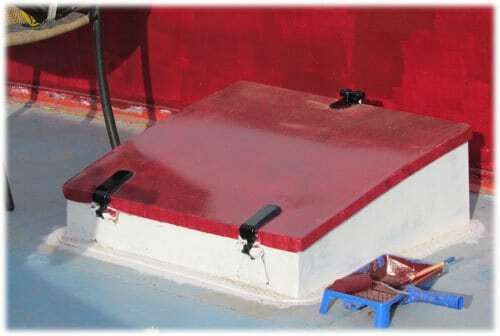 So when you walk aboard the Aquarel, two rooms have rivets and wooden hatches visible! Most work in breaking down an old interior is filling up the car and driving away with lots of rubbish! She is in a better condition then when I bought the Watergeus. 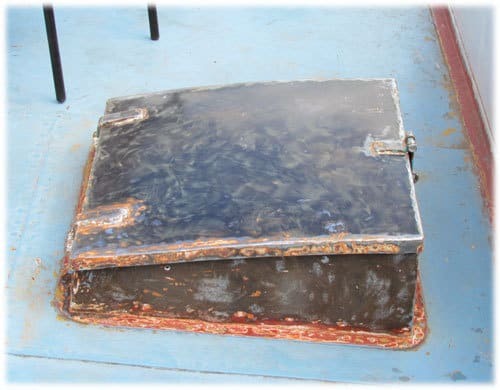 Nevertheless I still prefer an empty hull then one with an interior…. 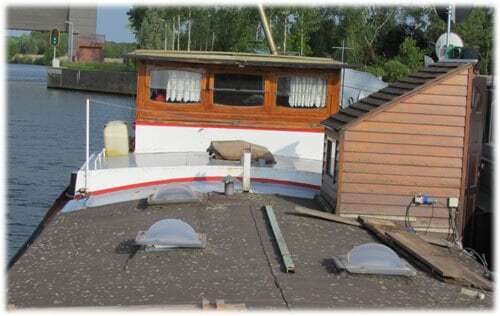 18th June 2013 – Cleaning the bow is one the things I want to finish before the winter starts. he whole ship looks very much neglected and is in need of a good coat of paint. The bow is rusty, but it is also the nicest part of the ship… I’ve done the hatch and the mast, now the deck and the bow! 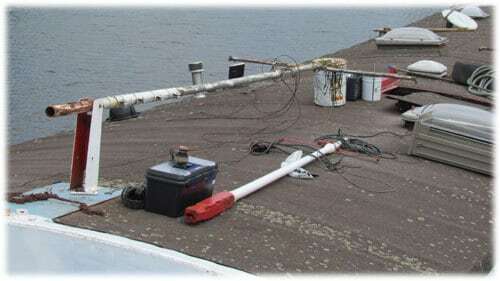 16th June 2013 – Besides repairing the damage done by the wind yesterday, I started on the bow. 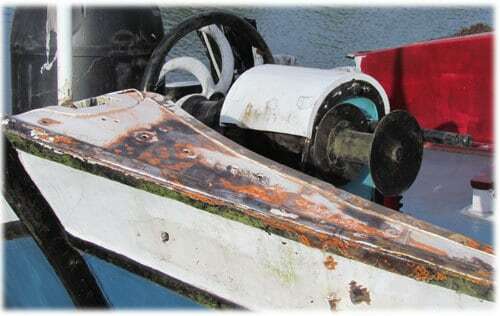 It will be a major job to remove the paint and rust of the bow! The old name signs are gone. I’ll reuse them as decoration at some point…. The mast got another coat of paint. It starts to look good! 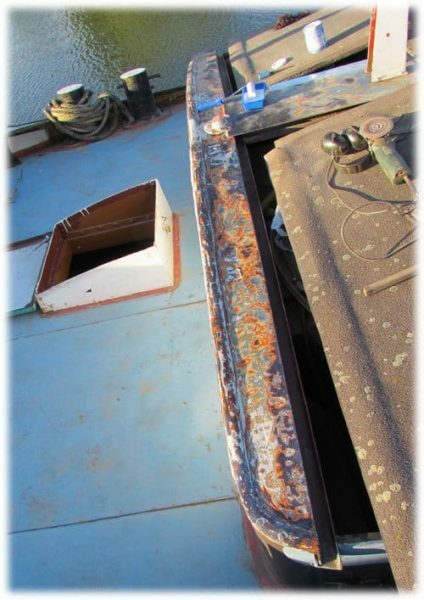 15th June 2013 – While I was cleaning anyway, I removed the paint from the hatch at the front of the boat. It was to windy to paint, still I decided to give it a go. Some grass and dust was blown into the paint, so I can restart…. 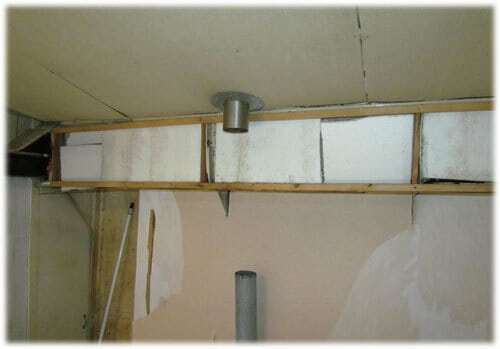 Out of frustration, I removed some more of the interior of the boat. Aquarel – What colour to take? 14th June 2013 – I have no idea what colours I’ll paint her. I have a few schemes in mind, but nothing is decided yet. 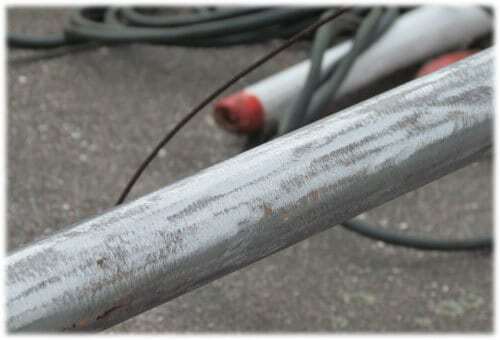 Before I can paint, I need to remove the old layers of paint and the rust. I started cleaning the beginning of the den. At the end of the evening I gave it a good coat of primer. 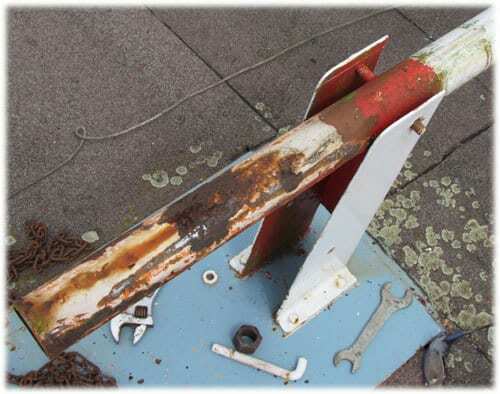 9th June 2013 – I believe a mast tells a lot of a ship. You can decorate it with some flag and all of the sudden, the ship starts to look vivid again. At the front deck is a small wooden mast. Just in front of the wheelhouse is a big metal mast with a satellite disk, spot lights and many cables! 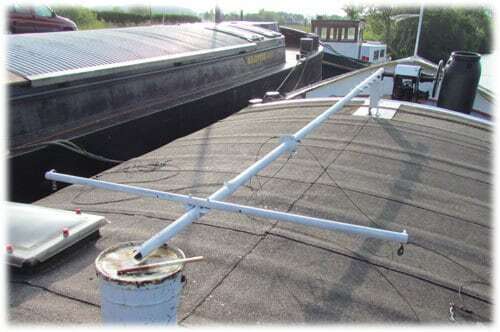 In my original plan, the big mast had to go, but I will re use it at the front of th barge. The little wooden mast is in storage and I cleaned the big one. It was al green and the paint was falling of. Some smaller things have been done today, like measuring the whole ship, cleaning my workshop and ventilating the boat as much as possible. 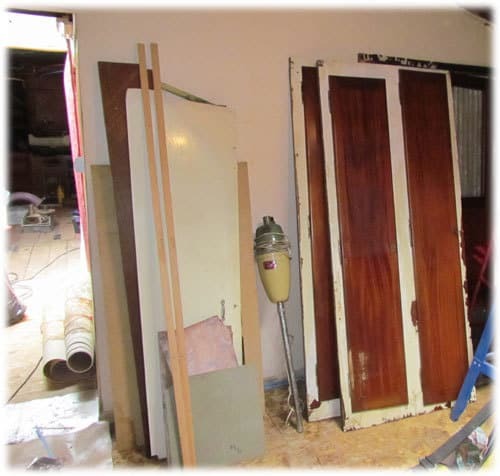 1st June 2013 – The engine room is a big mess. 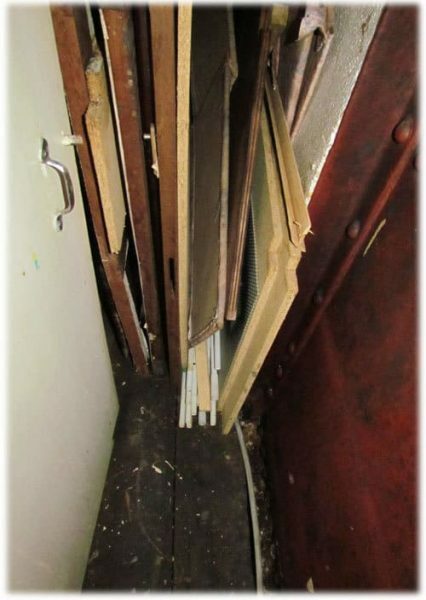 Not only did we a lot of temporary repairs during the trip, it is stored with rubbish, old metal, engine parts and toys. After two hours, I managed to see the see through everything. In the evening I discovered a ‘secret hatch’.